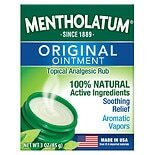 Shop Mentholatum Ointment/ Topical Analgesic/ Aromatic Vapors (3 oz. )3 oz. $799$7 and 99 cents$2.66 / oz.